It’s time to mourn and weep for the dead in Florida, time to try to help the wounded to recover. It’s not a time to keep silence. It’s time to speak, again and again until lawmakers face the fact that guns are used to massacre schoolchildren. Sandy Hook Elementary School. Marjory Stoneman Douglas High School. It’s time to SHOUT as loudly as possible until the SHOUT reaches lawmakers, and something is actually done about gun control. 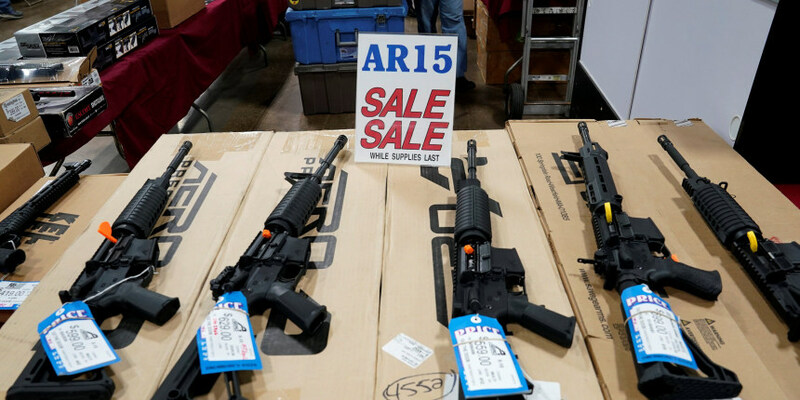 AR-15 rifles are displayed for sale at the Guntoberfest gun show in Oaks, Pennsylvania. Photo (by Joshua Roberts / Reuters) from an article “The Parkland shooter’s AR-15 was designed to kill as efficiently as possible” on NBC News. This entry was posted in gun control and tagged massacre at school. Bookmark the permalink. Thank you for saying it. I taught school for 38 yrs. Horrific things like this shake me to the core. I called my two senator offices and told them I expected action to help put an end to this violence. I was close to yelling. I hugged my son when he came from school. Thank you for taking action. It’s better yelling than weeping.